can I decide another day? : Why that tattoo? Teh Sister and I have a long standing history with origami. 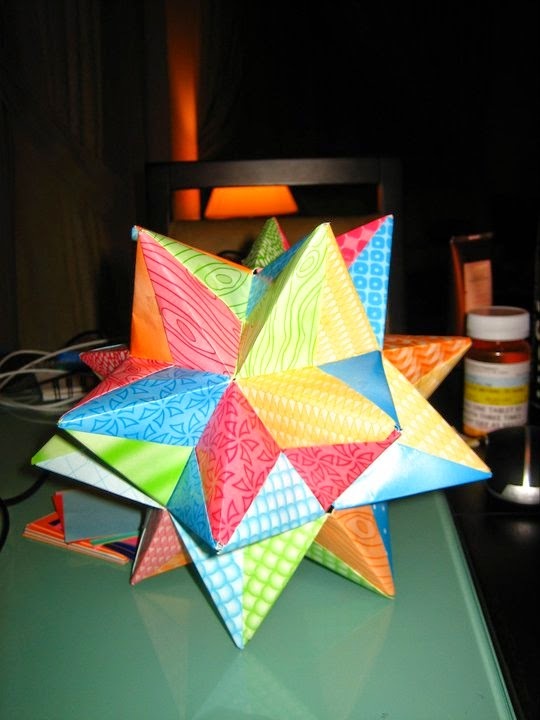 I started doing origami in middle school as a way to keep myself quiet during class (I was a talker, imagine that). This continued into high school and college and still happens on occasion when I'm struggling to stay quiet when I'm supposed to. I sat through my high school and college graduations making origami birds with the flappy wings. I passed the birds down the row to my classmates and eventually we had a row full of people flapping wings of paper birds during the ceremony... but I was still quiet! Teh Sister started doing origami at some point when I wasn't paying attention and she's much better at it than me. She likes picking the most complicated, intricate items and making them. A dracula riding a boat with an owl as protection and a bird swooping in. This was Teh Sister's Bahrain masterpiece. She keeps requesting a new origami day calendar so she can have more origami paper. 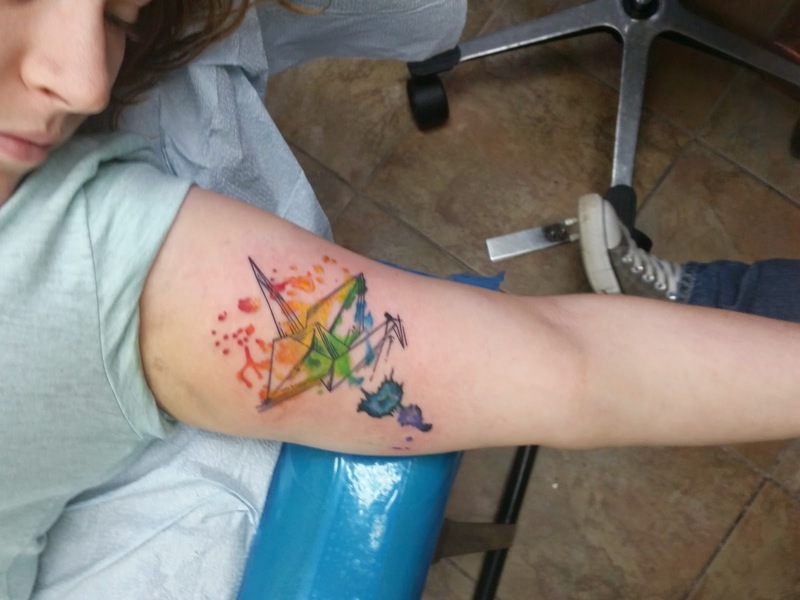 When I found a photo of an origami tattoo on Pinterest in March, I immediately sent it to her. 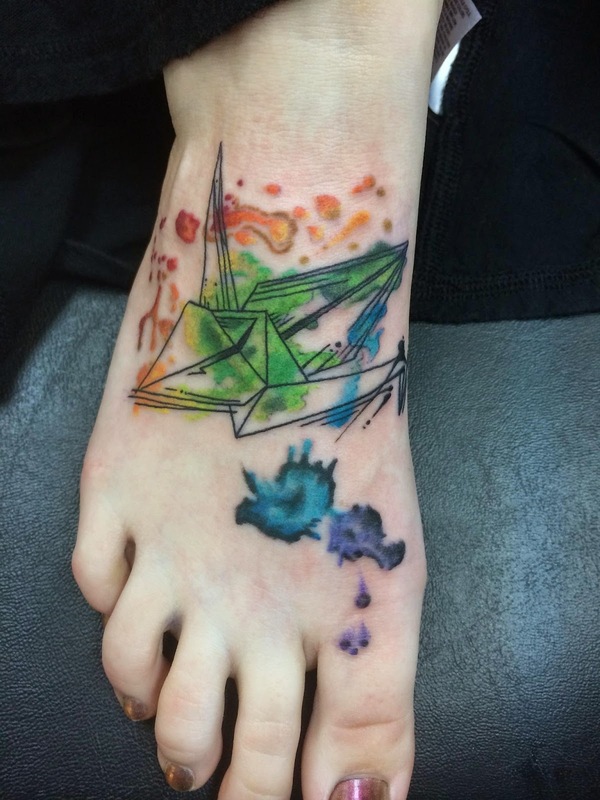 She said she liked it and I flippantly, but seriously said, we should get matching tattoos of an origami bird. And I expected her to be like, "yeaaaaahhhhhh..... no." Instead, she was like, "OMG YES WE SHOULD." And then it was game on. We took a month to figure out what we actually wanted. I knew I wanted some rainbow coloring behind it. I had 2 options for who I wanted to do it. There was a place called Warlock's Tattoo in Raleigh that I would pass on my way to campus each day when I lived in Cary with the Ex-Fiance. I always wanted to get a tattoo from there. My other option was Noel Mitchel, a guy that I had went to school with. I used to sit in science class in 7th grade and watch him draw and doodle during class and he was AMAZING then and I watched him in art classes during high school continue to be awesome. We graduated high school together and I had heard a few years ago that he had started tattooing. I checked out some of Noel's work before I committed to one or the other, but the balance was always in his favor since I knew he was good. We actually changed the line drawing the week before and were still making color changes when Noel was doing it. Teh Sister requested more yellow. I did as well after I realized just how much green I ended up with. I'm not a huge fan of the brown in mine, but I'm coming to terms with it, because its probably what water color would actually look like. When Noel was doing it, he was making suggestions and I told him that I trusted him to do whatever he thought was best, to go at it. He added some extra green shading and gave me more orange and yellow spots, despite my almost hyper-ventilation breathing due to the pain. So they aren't exactly the same, but they "match" enough for us. PS. I never thought I'd have a matching tattoo with Teh Sister. IDK. I had never considered it until this year when I saw the origami bird and then it just was meant to be. Good thing we like each other way more now than we used to. Sometimes its still strange to look down and see that my feet don't match anymore. Then again, sometimes I see the tattoo on my wrist and I'm like woah, what is that? It's been there since Dec 2006, you'd think I'd have it figured out by now... No matter how much seeing my foot surprises me, I still LOVE the tattoo. It's gorgeous. Noel did a great job. I told him I'd be back for my next one for sure. If you're in NC and want a tattoo, hit up Noel at Lucky 13 Tattoo. He won't disappoint you. Love this. Always enjoy hearing the stories behind someone's tattoos. If you had originally asked me if hubby & I would ever have a matching tattoo, I would have laughed in your face. But I saw something one day & went "Yep if we are going to do anything it will be that." And so it happened.